Take a Mosaic Murals Walking Tour at Philadelphia’s Magic Gardens every Sunday at 4pm. Get an insiders’ view of this Philly favourite for $10 @ 1020 South Street. Take an hour-long walk into alleyways along South Street and Bainbridge to view Isaiah Zagar’s glittering creations! 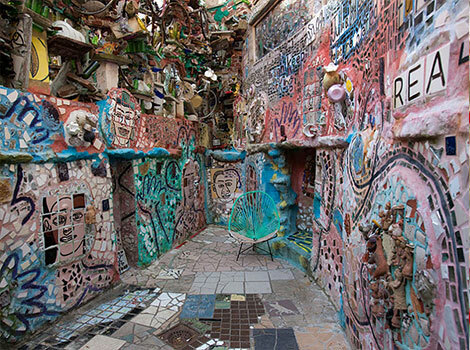 Led by a trained Philadelphia’s Magic Gardens interpreter, you’ll learn detailed information about Zagar’s technique along with the personal and community stories depicted in his large, shimmering murals.